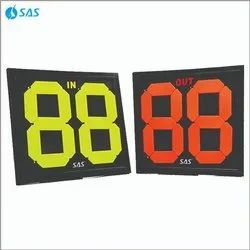 Specifications:Dimension: 6 x 4 ft.
Safety Score Board displays is used in industries to display various safety parameters like no. of hours without accident, no. of accidents etc. These displays help in keeping the safety statistics up to date and make it available to all. A scoreboard is a large board for publicly displaying the score in a game. Scoreboards can cater for any competitive sport where score keeping and timekeeping is an important feature of the game. 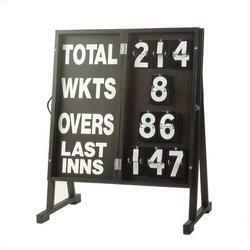 We are involved in offering the wide range of Cricket Score Board. It is used to show the effectiveness of the loom. LED cricket scoreboards generally have a digit height of minimum 12 and size starts from 4 feet x 6 feet with score, target, overs and wickets. - 6 ft. x 4 ft.
- 8 ft. x 4 ft.
- 6 ft. x 6 ft.
- 6 ft x 4 ft.
- 8 ft. x 8 ft.
Or as per any individual requirement.